The Andersen Corporation has built a rock solid reputation for their staunch support of environmental causes. As part of their dedication to uphold sustainable principles, they have worked with other leaders in the industry to establish its first Environmental Product Declaration. Andersen Corporation’s first Environmental Product Declaration is for a Renewal by Andersen Double-Hung window. The release of the EPD accompanies the publication of the industry’s Product Category Rule, a product of the collaboration of other industry leaders. 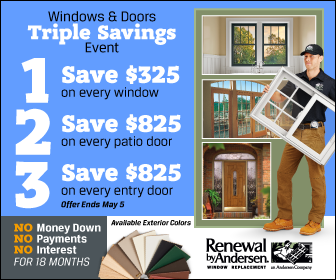 A leading Chesterfield, Missouri windows company, Andersen has worked with a collaborative team for the past four years in developing the window PCR. Product Category Rules define the scope in conducting life cycle assessments and EPDs. This aims to increase transparency and consistency across companies regarding manufacturers’ efforts to reduce product environmental impacts. The Leadership in Energy and Environmental Design rating system, among other green building certification systems, recognizes and rewards the utilization of products with a published EPD. The company’s first EPD addresses a Renewal by Andersen Double-Hung window’s cradle-to-gate lifecycle impacts. This window features Fibrex, a pre-consumer recycled material made of up to 40 percent reclaimed wood fiber. Enhancing product transparency also upholds the company’s commitment to the Ceres Climate Declaration and public sustainability goals, which involves reduction of operational water and energy use and waste by 20%, per unit of product, by 2020. Following the steps of our parent company, Renewal by Andersen of St. Louis upholds integrity of creation by offering environmentally friendly home replacements and additions. We carry an array of Chesterfield doors and windows that can help you transition into a greener way of life. Ask us about our green product offerings. Call us today at (314) 332-2364 to start on the path towards a brighter, more valuable home.